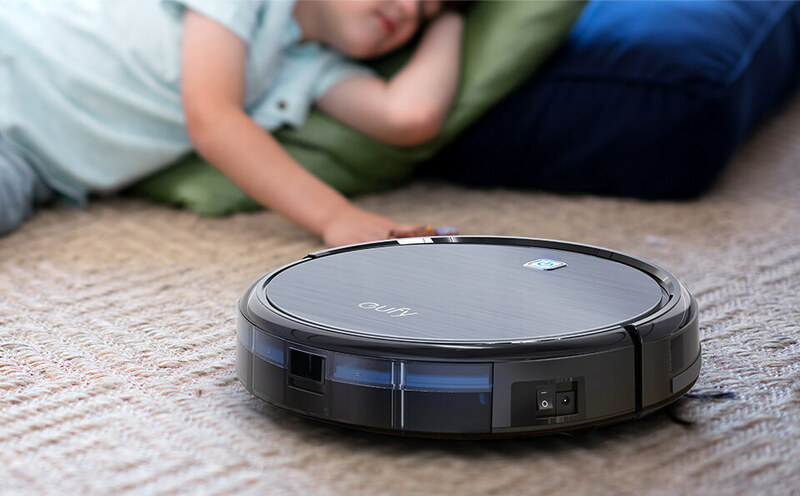 The Eufy RoboVac 11 is Amazon’s best-selling, best-rated and best-valued robotic vacuum. We were sent one for review purposes. Find out what we thought below, and grab your exclusive discount code too! I don’t mind blowing my own trumpet here, but I can be pretty good at some things. Housework is not one of these things. Being a self-employed Mum working from home means I have to juggle family, work and trying to keep fit every single day – that’s all the cooking, the cleaning, working a full-time job and finding time to exercise. There just aren’t enough hours in the day, I feel sometimes, and something has to give. More often than not it’s the housework. We are the proud new owners of a robot vacuum, and let me tell you, this has revolutionised things in our house. The floors are actually clean, and I don’t have to lift a finger! I even overheard the words, “Dad, can I hoover?” recently, uttered by our housework shy 9-year-old. True story! Watch our video above (you won’t see it if you’ve got an AdBlocker installed – scroll down to find an embedded YouTube video at the bottom of this post) to see us unpackage and assemble our new RoboVac 11. It was really simple to unpack and assemble, only taking a few minutes to set up. 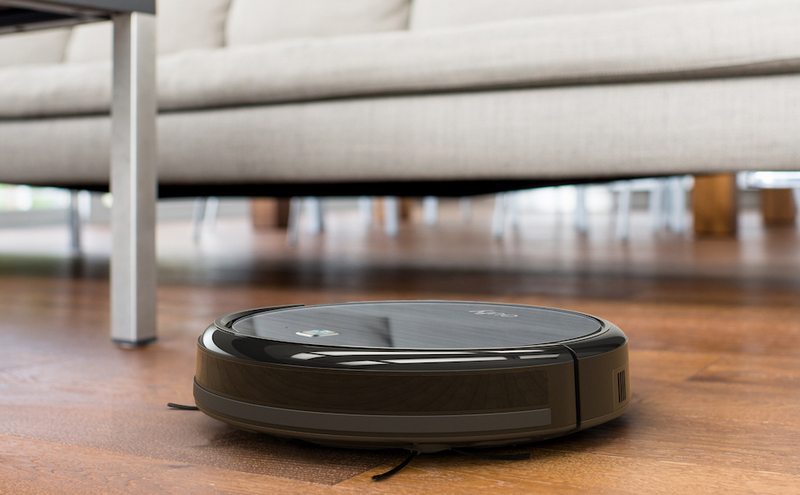 At the click of a button, the RoboVac will clean your house for you. Choose between three distinct cleaning modes: edge cleaning, spot cleaning and maximum cleaning, depending on what you’re needing. 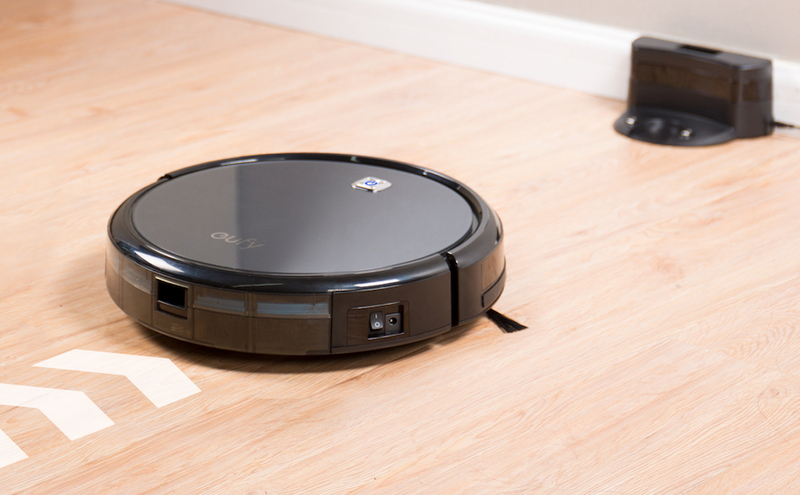 Alternatively, choose a single room cleaning and the RoboVac will intensively clean just one room in your house. 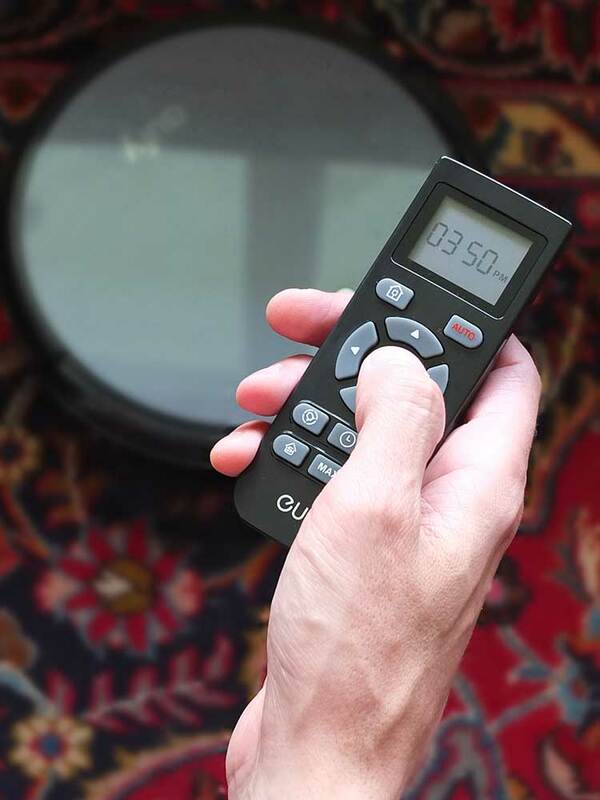 You can also choose manual cleaning, using the directional buttons on the remote control (this is also useful if you want to chase the kids and/or cats with the robot). 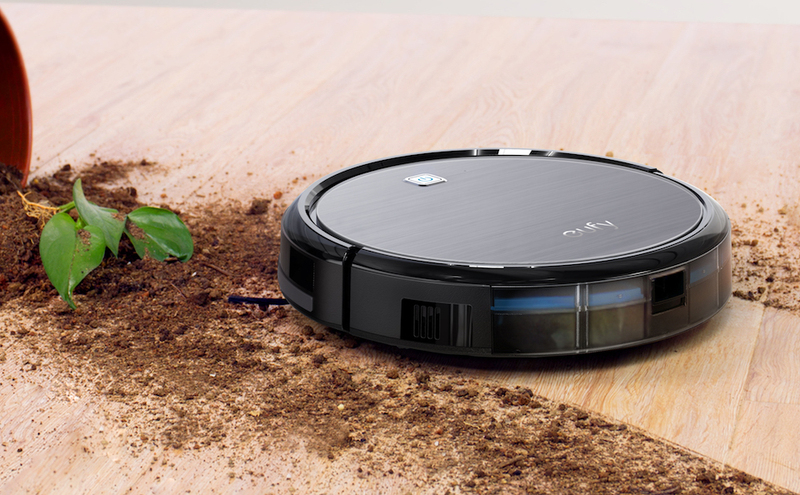 The RoboVac 11 will clean for up to 1.5 hours. When the blue light on the top turns to red it will stop suctioning and return to its charging port to recharge. Recharging takes about 300 minutes. Emptying the filter is really easy too, simply press the dust collector release button, pull the dust collector out, open and empty. Easy peasy! Replacement filters and brushes are fairly inexpensive as well. There’s no place this RoboVac clean. It stands only 78mm tall, so it can easily slide under your coffee table and couch, meaning you don’t have to move your furniture to clean under them any more. Its auto sensors detect where furniture, walls and items are located, and it cleverly adjusts its path accordingly. It’s pretty quiet too – not as loud as a traditional vacuum, and you can easily ignore it in the background. Frustratingly, we have raised thresholds in between each room (why?) and it can get stuck on these depending on what angle it approaches it with. We’re going to add beading on either side to help the robot overcome these obstacles. It also gets stuck under the storage heaters, so something needs to be placed in front to keep it out. The RoboVac also has anti-drop sensors to prevent it from tumbling down stairs and steep drops. Clever, no? All in all, I am seriously impressed with this machine (just remember to turn it off at night unless you want to be woken up by it cleaning your house in the middle of the night!). 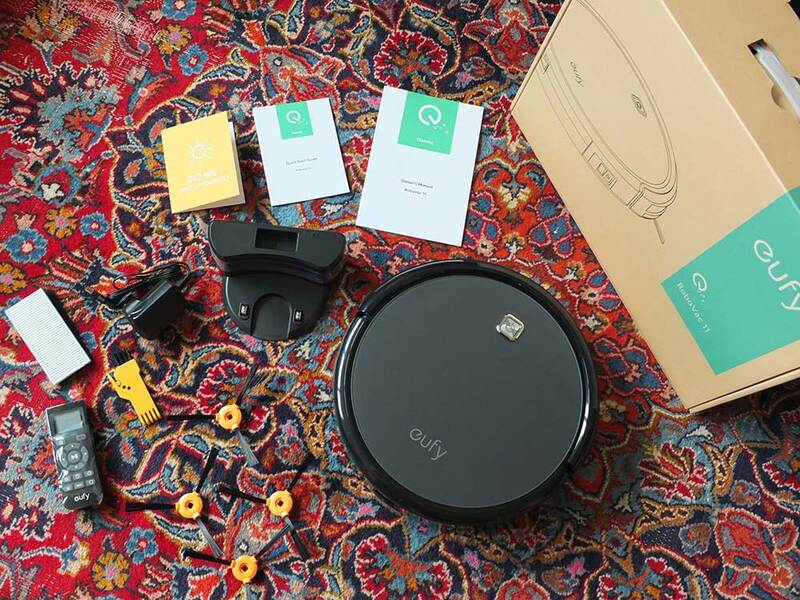 The Eufy Robovac 11 retails for £209.99 through the Eufy website. 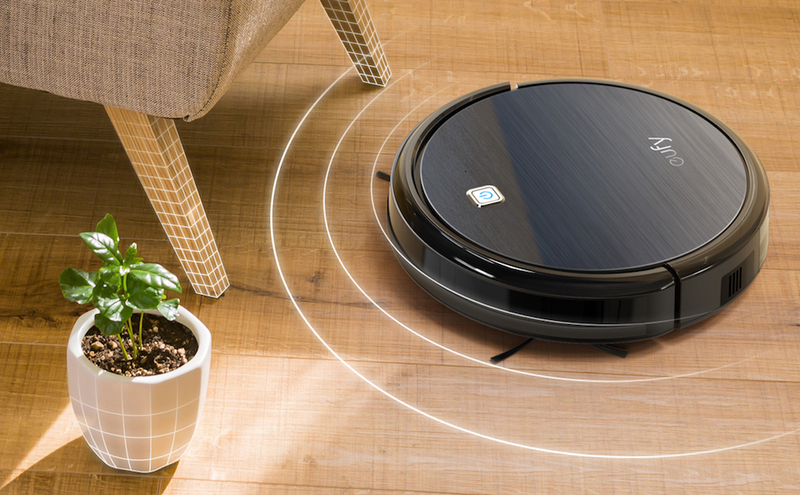 Use the limited code vaptno4 for 15% off your purchase of a RoboVac 11 from 11-13 of September 2018. Elizabeth’s Kitchen Diary was sent a complimentary Eufy RoboVac 11 for review purposes. This is not a paid post and all thoughts and opinions expressed are our own. Amazon links in this post are affiliate links, and we will earn a small commission if you click through and make any subsequent purchase within 24 hours. I am still waiting for mine to arrive, I cannot wait!! I’ve always wanted on of these – such neat little inventions. This looks great I’m sure my dogs would chase it around my living room. This looks fantastic! I need one of these with 2 kids under 2!